This small group activity/lesson plan comes from www.readinga-z.com. I am currently teaching my Pre-K students about identifying rhymes and word awareness, syllable awareness and sound discrimination - all parts of phonological awareness. The web site www.readinga-z.com is an amazing educational site that enables parents and teachers to print out books of every level for their children. They provide you with a free week to try it out. There are lesson plans to go along with the books as well as lesson plans for phonological awareness, learning the ABC's, and sooooooooooooooo much more. If you have a minute, go there are and check it out. It is a perfect site for teachers who need extra literacy resources for their students, either easier or more difficult books, etc.... It is packed with ideas. There are literally hundreds of books at this site, however it does cost about $85 a year, but for some teachers, it is well worth it. I have used reading a-z for my son and many other students as well and for random themes, like Cinco de Mayo, or hurricanes.... There are also books in Spanish! 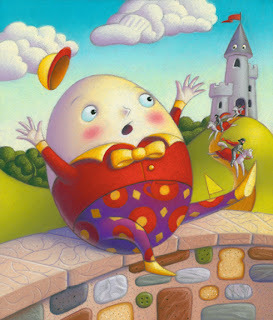 First read Humpty Dumpty to the kids, then clap out each word. Then read it again and omit the last word in each line and let the students fill in the blanks. Next, point out the rhyming words for them: Humpty, Dumpty, wall, fall, men, again. Let them hear the endings and explain what rhyming words are! Next clap out the syllables in the poem together with the students to emphasize syllables. Then clap out the syllables of each child's name. Then say the following sounds (not the letter names): /m/, /m/, /s/. Have the student repeat the sounds. Tell the student that /m/ and /m/ are the same sounds and /s/ is different. Do this again with other sounds and have the students tell you the sound that is different! Who tried to help him? Do you think he will ever be put back together again? Game: (Phonological Awareness - rhyming) Find pictures in magazines or online that rhyme. Make simple cards out of them. Show the children the pictures and name each one. Mix up the cards and have the student(s) see how fast he or she can sort the cards into groups of rhymes. Tell the student(s) the name of the picture if he/she forgets. Repeat the activity. Let each student have a turn.